Heron Cottage01535 648537work Self-cateringA well appointed cottage in a peaceful location just 15 minutes walk from Haworth. Converted in 1997 from a farm building ,the cottage has original exposed beams and is all on ground floor level. A conservatory leads to a private patio and garden beyond. It is well equipped with all bed linen and towels supplied. There is private off road parking, the river Worth runs past the garden and walks begin at the gate. Small supermarkets are ½ mile away, Keighley is 3 miles and Skipton, the gateway to the Dales, just a 20 minute drive. The train enthusiast can capture that special photograph overlooking Mytholmes tunnel and viaduct. 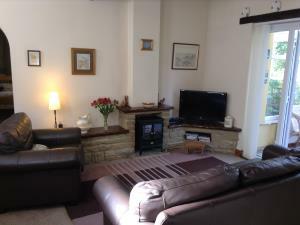 A well appointed cottage in 10 wooded acres, just 15 minutes walk from Haworth. The river Worth runs past the garden and walks begin at the gate. Scenes from The Railway Children filmed here. From the A629 follow the signs for Haworth. At Cross Roads turn down Vale Mill Lane, signposted towards Oakworth. As the road swings round to the right turn left onto unadopted Mytholmes Lane. Vale Fold Cottages are on the left, Heron Cottage is right. Mytholmes Lane is in two Rd sections linked by a footpath. To reach the cottage by car, you must access via Vale Mill Lane. From Keighley railway station take A629 (Halifax Rd) towards Cross Roads, turn down Vale Mill Lane off B6142 after passing Lees Primary School on right.